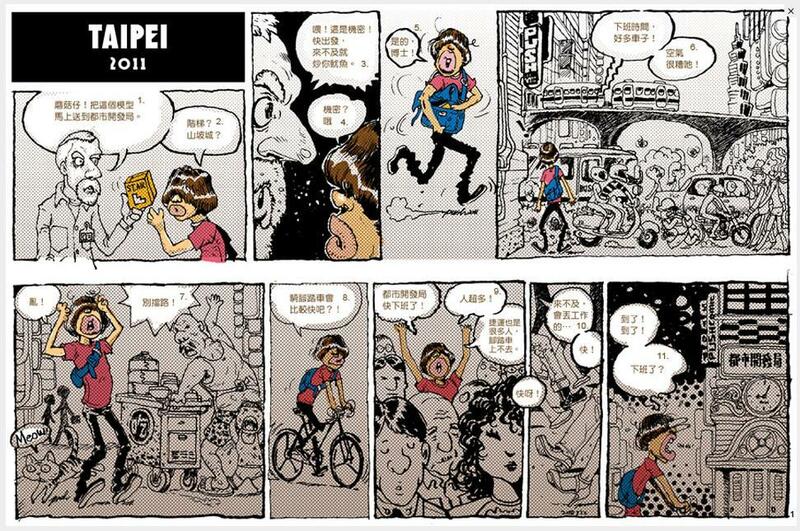 The cartoon by Push, the Taiwanese comic artist, illustrates the chaos of Taipei's traffic. Image via Morgenstadt, Goethe Institute. Goethe Institute’s sustainable cities project recruited Taiwanese cartoonists to artfully communicate the realities of climate change to the public. Joining comic artists from China, Japan, South Korea and Germany, the Taiwanese artists will be part of a yearlong project, “The City of Tomorrow—Stories from Today and Tomorrow.” The project asks artists to “imagine life in 2050 under the premise that a future of energy sufficiency and sustainability has been achieved,” Taiwan Today reports. “The works of these artists will give people a more concrete idea of what a future of sustainability will look like, and help them realize that climate change is not a general, remote possibility unconcerned with us here and today,” Wernhard added. Although some of these comics are lost in translation, the issues they aim to communicate are not unique to Taiwan. Population increase, chaotic traffic and the effects of climate change are issues facing all cities worldwide. We previously covered the role that comics play in environmental and political activism. In June 2010, we wrote about editorial cartoons in local Indian papers that hurdle communication divides between the nation’s state-specific languages. In addition to editorial cartoons, elements of popular culture can have a strong impact on influencing and inspiring political activism in youth. President Barack Obama’s Green the Block campaign, for example, reached out to the Hip Hop Caucus in an effort to educate and mobilize young people by using the power of hip hop. Read more about hip hop and sustainable cities here. The four Taiwanese cartoonists participating in Goethe Institute’s “The City of Tomorrow” project are Chang Fang-Chih, Lin Li-chin, Push and Grizzly Monster. Each artist will contribute five stories to the project’s website, which is available in Japanese, Chinese, Korean, German and English.